Here is our sweet, funny, smart, beautiful, persistent, and loving Emmy. She is everything I thought she would be. Not at first, though. Not when we found out about Williams syndrome. I wasn’t ok with the diagnosis at first and I thought, “Please just let me be ok with this by the time she’s 8 years old.” I gave myself ample time to let it sink in. Turns out that I only needed a year, but I’m glad I gave myself 8 because I think creating space is important. I was ok with it after a year. 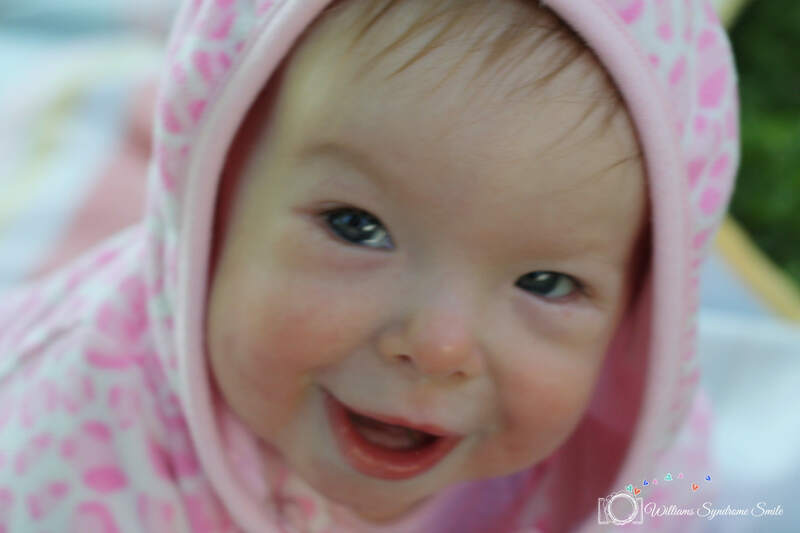 I was totally accepting of the diagnosis, and I was completely in love with Emmy–just as she was. And then she changed. Into more. And more. And more. And more. At four-and-a-half years old, she puts me in a state of constant awe. She is, truly, as sweet as her smile shows. She shares EVERYTHING. I took her to the library, and the librarian gave us a donut. Emmy said she wanted to save it until we got home, so she could share it with Charlotte. She is also witty and sly. With a more crooked version of her beautiful smile, she’ll goad Charlotte on. She definitely knows how to push buttons, but she does it in a funny way. If we’re eating a more adult-friendly meal like pot roast, she’ll knowingly say, “Good news, Charlotte! We having mac-and-cheese for dinner!” Then Charlotte will get all pumped up…only to be disappointed when she reaches the table. Emmy finds that hilarious. Charlotte is far from naughty, but Emmy totally knows that and loves to try and get under her skin sometimes. Emmy is very smart, and I feel for her because she KNOWS a lot, but her hands don’t work fluidly with her brain quite yet. So while she knows all the letters, writing is very difficult for her. I watch her hands shake slightly as she struggles to hold a pencil. Drawing a smiley face is an unbelievable accomplishment. I recognize how frustrating it must be to have your mind go one direction and your body another. Emmy has therapists in school, and they are consistently reporting back to me that she comes to the therapy room with a smile on her face, ready for anything–even if it’s hard. It’s funny because sometimes they say, “It’s a pleasure to work with Emmy.” And I picture this 4 year old in a little pinstriped business suit, marching off to work in the therapy room. What a trooper! Our life is quite typical…I think. Emmy likes to do everything that every other 4 year old does. She likes to get her hair braided and put on pretend makeup. She has favorite outfits, and she’ll often ask me if I washed her pink polka-dotted sweatshirt. She loves going to the park, and (naturally) she loves anything with sugar. In a way, I can’t believe I gave myself 8 years to be ok with this. That seems like a long time, when I have someone so irresistible right in front of me. But when you have a baby in your arms who you’ve barely met, and you’re reading about a scary diagnosis, all you can do is promise yourself that–in time–this will be ok. In time, you will accept and even appreciate the sweet gift before you. Luckily, she is everything I thought she would be–and much, much more.